Text neck is a very real condition that is caused by staying in a prolonged “texting” position – hunched shoulders and neck tilted forward. As a result, the back, neck, and shoulder muscles become overworked and your spinal structure is actually changed. Many people who spend a lot of time on their mobile devices such as smartphones and tablets, develop this condition (and others including “cellphone elbow” and tendinitis of the wrist and hand) and it can be very painful, even causing mobility problems. 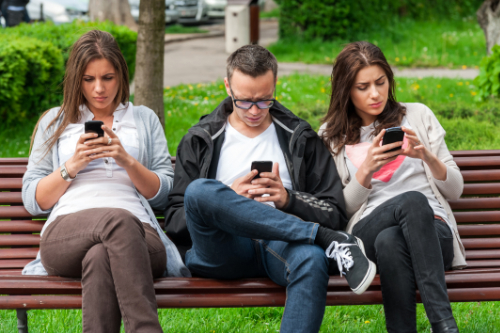 More than 95% of Americans have a smartphone or mobile device and most people spend a great deal of time on their devices – it is easy to see how this is a common problem. When you keep your head tilted forward, such as when you are hunched over your smartphone or mobile device, your head is thrust forward instead of sitting over the balanced curve of the cervical spine. The gravitational pull is greatly increased and the neck is already in an unnatural position. This combination places unnatural and damaging stress on your neck. It is like carrying around an additional 60 pounds on your neck. In the early stages of text neck, a person may feel some tightness in their shoulders, neck, and upper back. This may progress to discomfort in those areas and eventually pain. If left untreated, you can develop pinched nerves and herniated discs. Your central nervous system begins at the base of your skull, so it extends down your neck and upper back. When you put unnatural pressure on your neck, you are also affecting your nervous system, causing it to malfunction. This can lead to pain throughout your body, stiffness, headaches, low back pain, and problems with your hands and arms. Text neck is surprisingly easy to prevent. Your first step is awareness. Over two or three days, take some time to be very aware of your body’s position. Carefully examine your posture while you go about all of your daily activities. It is important to remember that text neck is not strictly confined to texting. You can get it any time you have your head bent down for an extended period of time, such as when looking at a laptop screen or even writing for a long time. If you are already suffering from the effects of text neck, your chiropractor can help reverse the condition if it hasn’t progressed to disc degeneration (even then he or she can help with associated pain). Regular chiropractic treatments, along with following expert recommendations for screen heights, can help reduce the pain and discomfort. It is smart to address these issues before they become a bigger problem. Your chiropractor can help.